I didn't do an In My Kitchen post last month and I found I rather missed it. They are certainly fun posts to put together (reflected, I think, in the number of people now doing them). I'm pleased to be back with a post for July. In my kitchen this month, we have these raw, vegan Kitz 'Mexican buckwheat' crackers. I bought these in Fremantle, which never fails to deliver some edible delight. I loved them. I was, however, perplexed by my taste buds saying "Hey, we've had something like this before! I know this taste!" whilst my brain said "Really? I don't know when that would have been. Nope, no recollection at all". I thought I might have been remembering the vegan flax beetroot crackers I had in London, but these crackers taste differently to those ones. Leaving aside the disconnect between my taste memory and my other memory, these crackers were crunchy, tasted like tomato salsa with a spice kick, and I wish I had a dehydrater so I could make my own. In my kitchen, we have red / purple kale and fennel. Red (or purple) kale and fennel, with celery behind. The rest of the vegetable box. In my kitchen, I am still getting the odd fright from my neighbour's garage-based statue. It is a year on from when I first mentioned this problematic statue. As Mr Bite pointed out the other day, it doesn't move. It is, in fact, quite predictable. And yet...seen out of the corner of my eye, it still gives me a shock. In my kitchen, I have had some Kingland Soy Yoghurt pots. I like them more than the soy yoghurt brand I previously bought, and have found that the small 125g pots serve as a nice mid-afternoon snack at work. I still miss my real, pot-set yoghurt, but until I master non-dairy yoghurt making these work well for an occasional yoghurt hit. They also allow me to make bowls like the one above, consisting of weetbix, yoghurt and banana, which is one of the few ways I will enjoy banana outside of frozen / smoothie / baked form. In my kitchen, I have had some 'emergency' soups. 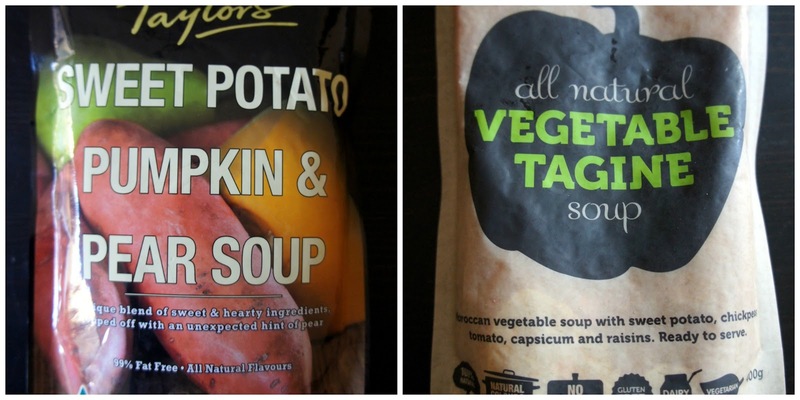 If you do buy commercial soups yourself, I'd recommend both of the above. They come in sachets rather than cans, which seems to be a new trend in soup packaging. The sweet potato, pumpkin and pear soup tasted of (surprise!) sweet potato, pumpkin and pear. The only criticism I can levy at it is the suggestion that the pack gives 1.6 serves. I won't begin to try and understand who thought that was a good idea. The vegetable tagine had chickpeas and raisins (trust me on the raisins, they worked) and was mildly spicy. As a bonus, it also had a helpful 2.0 serves. In my kitchen, there is brown basmati rice. I found this at the bulk food store where I buy my nuts and legumes, and it's the first time I've seen brown basmati. I cooked it with the juice of two lemons and fell utterly in love. In my kitchen, there were some chocolate covered straweberries. I saw 'were' because we ate them all on Sunday night, when my brother came over for dinner. These were a cheating sort of chocolate covered strawberry, as I simply melted chocolate (50 cocoa Whittakers) and dipped the strawberries into it before allowing them to set. It's certainly an easy way to dress up fruit! Now for the buckwheat, I don't have a dehydrator either, but have been playing with it a lot since Christmas time. If you turn your oven down really low you can get similar effects with buckwheat baking particularly. I'm hooked on sprouting it and it works really well. I'm sure you could make some of these crackers easy peasy. G'day! I have MANY days where I don't know HOW ingredients for into my pantry, true! Love your choc covered cherries and thank you for your kitchen view! Mexican buckwheat crackers sound like an interesting snack, I'll keep an eye out for them at my local health food store. Those "emergency" soups appear to be less processed than a lot of the other packaged soup products out there but the serving sizes do seem a bit odd. Thanks for the reminder about IMK - I must get organised and write another of these posts for this month! I found that it was a good way to write about bits and pieces I don't have the time to do full posts about. I really want to find some of those buckwheat crackers they sound so delicious!!! I have not seen basmati brown rice before either, I will have to look out for it. I ate them all but one of the best crackers I found were these grain free ones made from dried tomato and seeds, they were super tasty and delicious, I can't remember their name off hand. Good crackers really are good, aren't they? I wish they could all be of that variety! Great stuff! I wished I had fennel the other day - found an interesting recipe in my bookmarks with it but I so rarely buy it. I used to have leftover soup in the fridge but never manage it these days (I think that is the Sylvia factor). I wondered if you had seen this post about dairy free yoghurt - http://myfunnylittlelife.com/2013/06/30/cashew-yoghurt/. And I was surprised to hear that dipping strawberries in chocolate was cheating - sounds excellent to me. Is there another way to do it? OH MY purple kale! Never seen that before. Those buckwheat crackers sound great, gotta keep my eyes open for these things. Ahhh, creepy mannequin! And I haven't seen soup in satchets like that, it looks very hip and modern, ha ha. Chocolate covered strawberries is such a good and simple idea, I should do that sometime! Pretty much anything is good with chocolate. Exactly. Even just straight up chocolate! That is a creepy statue! Thankfully I just have my backyard to look at out my kitchen window. Those strawberries look so yummy. I could eat fruit all day during the summer. Wow..that statue is freaky...oh my...On the other hand, your kitchen is full of deliciousness! I rarely buy fennel either but when I do, I throughly enjoy it..it makes me wonder why I don't purchase more frequently. Both of the soups sound amazing as well. I have yet to see the new packaging. But then again, I don't purchase pre-made soup much due to the high levels of sodium. In my kitchen, there's a plenty of lettuce, basil, mangoes, and spiced nuts. I would take some mangoes and spiced nut in my kitchen - yum! oooh I would love one of those strawberries! Thanks for clearing up the kale mystery! I'll make sure I cook it well to avoid the toughness that sometimes does mark out kale :-) I'm glad it isn't just me with scary object too! I made soup today - pea and ham. It must have been a soupy day all around. Love the peek into your kitchen but that statue would have to get a baseball bat because it would drive me nuts. hehehe yes that statue is a big bizarre and I can understand why it would give you a bit of a shock!!!! I'm glad it isn't just me!